Royalty-free vector illustration of a smiling young child dressed in a bat boy costume, holding arms in the air to show off bat wings. Royalty-free vector illustration of a happy young red-haired girl in her dinosaur costumer getting ready for trick or treat. She seems to be enjoying her lollipop! 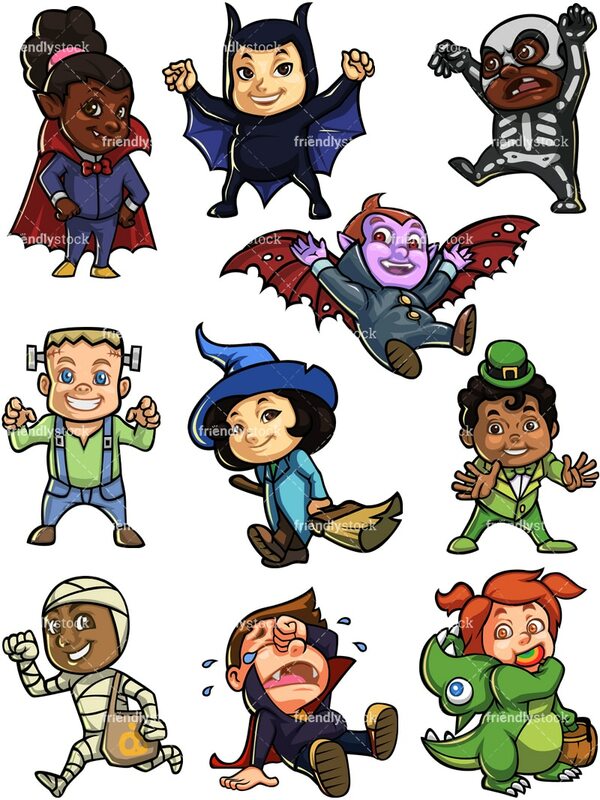 Royalty-free vector illustration of an excited little boy dressed up as Dracula for Halloween. His arms are raised above his head as he shows off his wings. 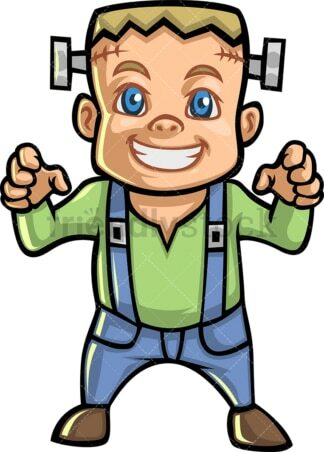 Royalty-free vector illustration of a boy dressed up as Frankenstein, trying to look scary. Bolts are sticking out of his head and he’s holding up clenched fists while smiling. 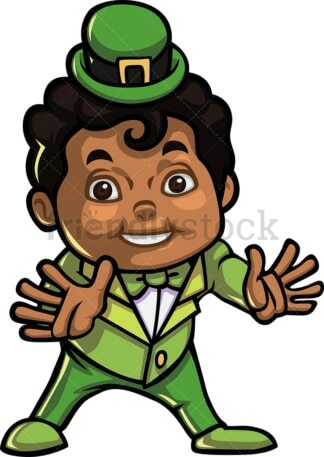 Royalty-free vector illustration of a young black boy dressed up as a leprechaun for Halloween. He’s smiling and ready to go trick or treating! 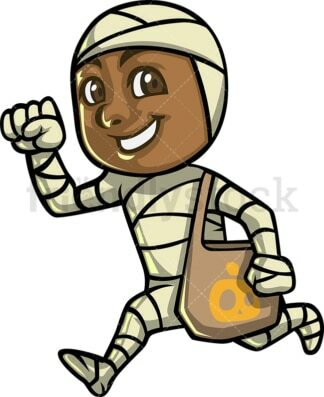 Royalty-free vector illustration of an excited little black boy dressed up as a mummy for trick or treating on Halloween. 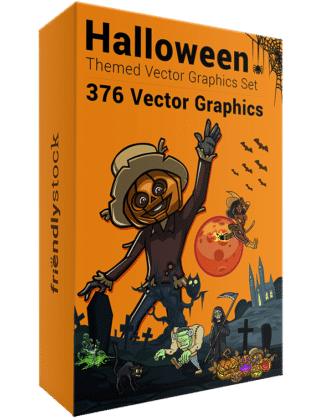 Royalty-free vector illustration of a young black boy dressed as a skeleton, ready for Halloween fun. He’s trying to be scary but is too cute! Royalty-free vector illustration of a little boy dressed as a vampire sitting on the ground, crying elephant tears and covering his eyes with his fist. 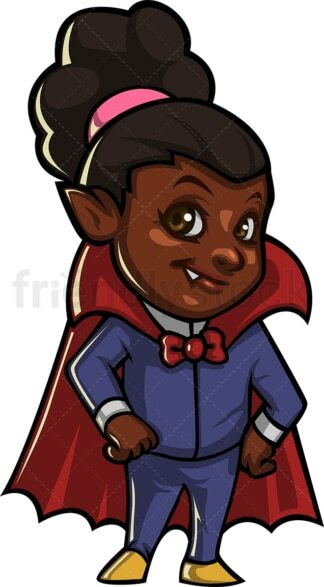 Royalty-free vector illustration of a pretty black girl dressed up as a vampire for trick or treat on Halloween. She’s wearing a red cape with yellow shoes and has pointed ears. Royalty-free vector illustration of a cute little girl dressed as a nice witch for Halloween. She’s wearing a blue coat and blue hat and is holding a little broom.